Photo: Archibald McAllister House, ca. 1814, 5300 North front Street, Harrisburg, PA. Listed on the National Register of Historic Places in 1976. Photographed by user: Smallbones (own work), 2013, [cc-by-3.0 (creativecommons.org/licenses/by/3.0)], via Wikimedia Commons, accessed December, 2013. County government offices are located at 2 South Second St., Harrisburg PA 17108; phone: 717-780-6300. An examination of the names of townships, municipalities, and streets located within Dauphin County reveals the names of the courageous, tenacious men and women that left their homes in Philadelphia, West Chester, France, England, and Ireland to forge a new life in a pristine land. The first group of settlers, the French Huguenots such as Letort and Chartier, pushed through the frontier until they reached the Susquehanna River and the Indian Village of Peixtan. The original residents of Peixtan, the nomadic Lenni Lenape Indians, Received these pioneers and served as guides for the newcomers as they searched for animal pelts. Survival in the harsh, rugged frontier demanded perseverance from those daring enough to surmount its daily challenges. The Scotch-Irish, colonists that possessed these attributed, migrated from Ulster, Ireland to the disputed Pennsylvania-Maryland border and then to the areas along the Susquehanna River in the early days of the eighteenth century. Names such as Chambers, Maclay, and Stewart and Kelker appeared in early records listing the original inhabitants of Peshtank, Derry, Londonderry, and Hanover Townships. The Chambers family chose the mouth of Fishing Creek (currently the site of the Hunter Mansion) as the location for their family residence and mill operation. Many years later the Chambers family moved down the Susquehanna River and founded Chambersburg. 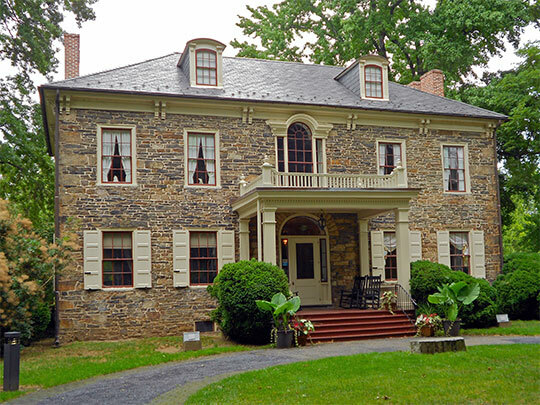 In 1729 Peter Allen, one of the first colonists to explore and settle the land north of Paxton Creek, constructed a stone dwelling at the mouth of the Swatara River, which is believed to be the oldest building in Middle Paxton Township. British pioneers also colonized the area along the Susquehanna River during the early 1700's. The site of an old Indian village called Peshtank and convergence of various Indian trails proved an acceptable location for John Harris to construct his home around 1719. He built a log cabin near the present site of Paxton and Front Streets and operated a ferry route across the Susquehanna River. This village called "Harris' Ferry" flourished as many more people moved into the territory. Colonists continued to arrive from Ireland, England, France, Germany, and other parts of the Province, as Pennsylvania was known, and to situate their homesteads along the fertile valleys of the Susquehanna River. During the 1750's the prosperity of these villages and the peaceful relations enjoyed with the Lenni-Lenape and Iroquois Indians slowly diminished as tensions mounted between the Indians, the French, and the British. The once tranquil territory became marred by violence and brutal murders of both the Indians and the white settlers as the French and Indian War raged. Bayonets and swords had just been retired from the battles of the French and Indian War when the residents of the territory found themselves in the American Revolutionary War. Battling to secure their freedom from the excessive English taxes and dominance, the colonists enlisted the support of the French, which proved effective. On March 4, 1785, the colonists in the territory known as Lancaster County, triumphing in their new freedom, elected to demonstrate their appreciation for the French efforts and divide Lancaster County into two counties, naming the new county "Dauphin", after the oldest son of the King of France. By 1791 the United States had elected its first president, the Bill of Rights was added to the Constitution of the newly created United States, and John Harris lived to see the fulfillment of his ambition to establish the Borough of Harrisburg. His son, John, not only shared his father's aspirations to establish Harrisburg, but also believed that someday this town would be the seat of government in Dauphin County, and perhaps the location of the state's capitol. Harris and William Maclay designed the street pattern for the town with these goals in mind. They selected several blocks for the location of the county and state government buildings and designated them as public grounds. John Harris' dream of locating the county government in Harrisburg met with little resistance; Middletown and Carlisle were considered, but Harris' arguments for Harrisburg were convincing. Harris encountered more hindrances, however, in his request to establish Harrisburg as the state capitol. The Legislature in Philadelphia realized that the perimeter of Pennsylvania was increasing as more people moved from the eastern cities to the western frontier regions, and they would eventually have to move the state capitol to a more central location for the shifting population. In 1795 the House agreed to relocate in Carlisle, but the Senate rejected this plan. In 1798, the House selected Wrightsville as its new location, but again the Senate refused. Finally, one year later, both parties agreed that Lancaster would be an acceptable location for the seat of government. For thirteen years, state governmental activities transpired in Lancaster while John Harris' public land set aside for such activities would serve as a spot where Harrisburg citizens would excavate sand and gravel. Unsatisfied with the facilities and location of Lancaster, however, the Legislature again decided to relocate. In 1822, twenty-seven years after John Harris began his crusade to establish Harrisburg as the state capitol, the gavel struck the Speaker of the House's desk on Capitol Hill in Harrisburg and the Legislature commenced operations. Activity not only flourished on the blocks occupied by governmental buildings, but also throughout Dauphin County. In the late 1820's, an agreement was signed to bring the Pennsylvania Canal through the County, linking it to markets of western Pennsylvania, as well as parts of New York and New Jersey. Barge traffic along the Susquehanna River escalated, bringing new products, ideas, and residents to Dauphin County. The Pennsylvania Railroad, destined to become the world's largest railroad, built its first section of railroad from Harrisburg to Lewistown. Steel companies such as Bethlehem Steel developed in the area to support the railroad companies' need for steel products. The area's centralized location in the state and access to a major waterway, the Susquehanna River, made it an ideal center for transportation. Lumber mills soon dotted the shoreline of the Susquehanna River, sending their timber products downstream to the railroad centers throughout Dauphin County. The various industries that developed along the scenic Susquehanna River banks, the early battles argued in the original capitol building, and the early relations between the Indians and settlers such as Harris, Chambers, Maclay, and Allen are all rich, valuable reminders of the Dauphin County heritage.